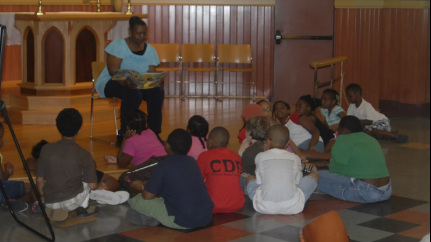 ENHE offers intensive reading enrichment and community building through an integrated, thematic curriculum. Our small student/teacher ratio of 6:1 enables children to receive the guidance needed to prevent summer learning loss, prepare for the upcoming grade and increase reading levels. Recognized reading tests are administered both before and after the program. They have shown that almost all (about 90%) of the children improve their reading skills. Testing covers phonics, reading comprehension, sight words and fluency. Harambee means “pulling together for a common purpose.” Each day begins with our version of Harambee, a morning celebration that includes chants and cheers and social skills instruction. We invite members of our community to visit and be one of our daily guest readers. These positive role models provide encouragement to the children with stories that show their passion for reading and how literacy is foundational to their life and vocation. Our teachers implement a balanced literacy program that incorporates writing and all five essential elements of reading instruction: phonemic awareness, phonics, fluency, vocabulary and reading comprehension. Various afternoon projects are facilitated by community organizations, teachers, and artists. These projects are connected to our theme, "My Family, My Community, My World," and provide students experiential learning in the arts and humanities. 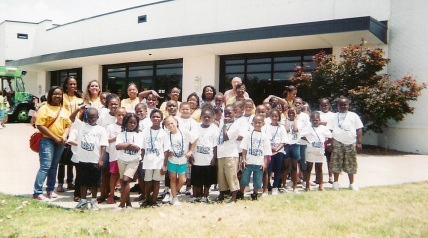 A variety of field trips are scheduled throughout the program offering cultural enrichment and fun. These include visiting places such as the Frist Center for the Visual Arts, the Nashville Zoo and the Adventure Science Center. Students take home a new book each day of our program. In the summer that means each child gets at least 29 new books! 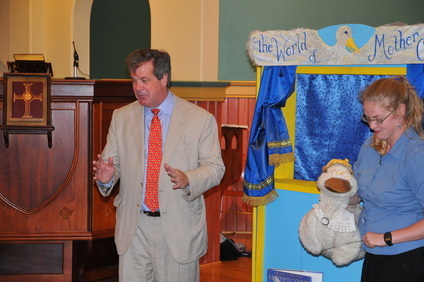 Above: Nashville Mayor Karl Dean, a regular guest reader, with the Nashville Public Library’s Puppet Truck Show. Designed for family members, these sessions provide tools to make reading a year-long priority and ensure the child’s success in school. Topics include sight word games to make learning fund and how to ask comprehension questions while reading. East Nashville Hope Exchange has a yearly $30 registration fee per family, and scholarships are available. Nashville’s Summer Food Service Program allows us to provide nutritionally balanced breakfasts and lunches daily, plus we provide donated snacks. We enroll children in East Nashville from schools in the Stratford and Maplewood cluster areas.